Our most versatile, best-selling spice blend is gorgeous in pasta, sauces, soups on veggies meats and fish. Rich basil, oregano blossoms and fresh garden herbs with raw and caramelized garlic tones, finished with cracked black peppercorns and coarse sea salt. Simply delicious in salads, tofu, eggs, potatoes, breads or on the barbeque. 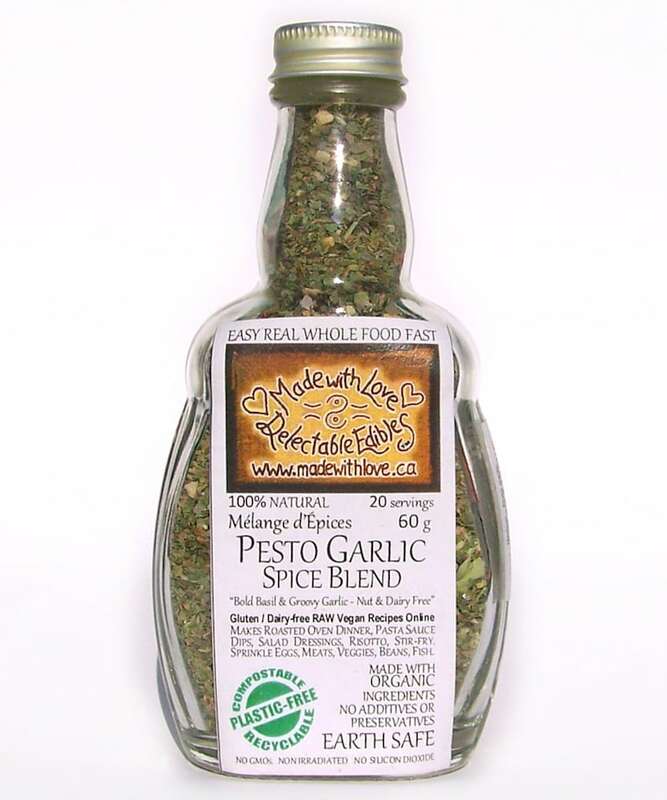 Pesto Garlic is the crowned king of our 100% natural, Eco Gourmet Spice Blends. This adorable 4.5 oz medi size glass bottle is hand dipped in natural small farm beeswax & comes nestled in our signature eco gift box with gorgeously green kraft tissue, dried flowers, herbs and spices. 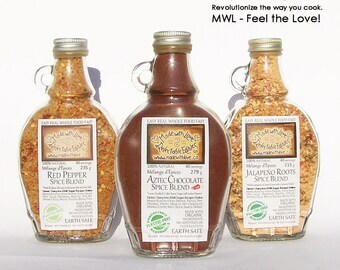 Everything at Made with Love is made from natural, non-irradiated and organic ingredients. We work hard to source from small organic farmers often and everything we create is made lovingly by real human hands. Ingredients:dried herbs & spices, garlic, raw unbleached turbinado sugar, sea salt. "I love Pesto and this blend is my fav. I can't live without it. It should be a staple in all spice cupboards. I put it in a grinder and sprinkle it on everything from salads to bread dough, pizza, in soups and dressings too. It has such a nice garlic and basil flavor. And since I have a nut allergy, and I can't have pine nuts, it is awesome..."
Just sprinkle a little Pesto Garlic before cooking / marinating to make your whole world taste good! 100% natural, handcrafted artisan blends of veggies, herbs and spices... feed yourself and your loved ones very well, while simultaneously nourishing self with calm simplicity and ease. Make magic gourmet "10 minute" pasta bowl dinners with rich gorgeous real cream sauce or decadently divine clear sauce. Gorgeous rich winter soups and roasted oven dinners in only a few minutes prep. All can be made Vegetarian or with omnivorous meat recipe options as desired. Gluten-free, Vegan, Raw, Dairy-free and loads of great everyday recipes provided. Roasted Oven Dinner: Just sprinkle generously on large chunk or baby veggies and a whole chicken/ meat roast in a roasting tin. Drizzle with olive oil. Bake 375*F 60-90 mins. Rice Hot Pot : just cook with your favorite rice or whole grain. Stir fry: just sprinkle veggies and meat or tofu. Creamy Dressing: Mix with yogurt or buttermilk and mayo OR fat-free yogurt. Marinade or Vinaigrette: Mix with Oil and Vinegar or lime juice. Cream cheese or Vegan Spread: Mix with cream cheese or hummus. Veggie or Chip Dip Mix with Mediterranean yogurt or sour cream and mayo OR our soy base. We welcome payment directly with Visa or MC by phone to 250 554 5031 or by email money transfer. International orders please contact us directly for shipping quotes. Thank-you for your conscious spending!